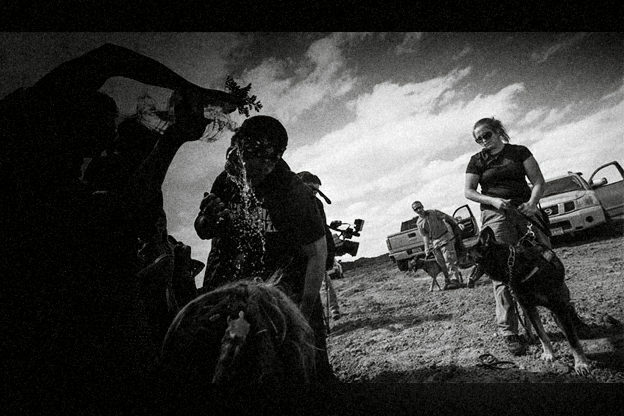 Standing Rock protesters dealing with pepper spray	(www.rollingstone.com). Ah, isn’t it lovely to be so special, so specially immune from the law? Except it’s not at all different for the media. The First Amendment offers the same protection to the media as to the rest of us, including when it comes to possessing or distributing illegally obtained material (so long as you weren’t involved in the original illegal hack or interception or leak). Indeed, in the 2001 Bartnicki v. Vopper decision, the Supreme Court rejected even civil liability for distributing illegally intercepted cellphone calls, and expressly refused to distinguish the media from others . . . This is a terrific piece, by the way, partly because it cites my favorite First Amendment case, Times against Sullivan. The temporary ex parte restraining order was dismissed because the judge found that Sandra Grazzini Rucki didn’t live in Washington County. She was living in jail, of course! Because SGR was in jail, there couldn’t even be a hearing on the order, so Michael’s lawyers didn’t present — didn’t have to — First Amendment arguments that Michael’s reporting was protected free speech and press activity. Grazzini Rucki’s irrepressible lawyer, Michelle MacDonald, says that she’ll fill out another application for a restraining order in a few weeks when SGR can again feel the sun on her face. This issue of shooting the messenger when you don’t like the message plays out time and time again. There is a new Matt Taibbi article on the Rolling Stone website describing how Amy Goodman has been charged with criminal trespass for reporting on the corporate violence surrounding the pipeline protests at the Standing Rock Sioux Reservation in North Dakota. Why? Because she was not acting as a journalist. I wish I could tell you that I, or the prosecutor, was making that up. I guess the problem is that Amy Goodman was not being sufficiently fair and balanced in her reporting. Too much about dogs and pepper spray. And she didn’t have a badge from one of the big networks. Some of you will recall that Amy was also arrested in St. Paul during the Republican National Convention in St. Paul in 2008 for criminal reporting, or something like that. It is very troublesome when private individuals or companies marshal the legal system to shut down expression they find objectionable. When somebody tries to do it to NBC, or the New York Times, or the Strib, they can fight, and sometimes bite, back. But it is harder for Michael Brodkorb, or Amy Goodman and Democracy Now to respond. That is why a judge in North Dakota, or one looking at another temporary harassment restraining order before a hearing, needs to give the case a good, early look when the First Amendment is involved. Russian government complicity in computer hacking of the Democratic National Committee and other political institutions and individuals is a direct attack on our democracy. In response, the U.S. government should ramp up sanctions to make it clear to Russia — and to any other country considering similar tampering — that this is unacceptable. There were a couple of things missing from the editorial. First, any proof that it was the Russians who were responsible. People think they were, and the government says so, but I always thought that the media were supposed to be skeptical of what the government told them. Second, there was no statement, and no credible claim anywhere, to my knowledge, that anything in the Wikileaks disclosures were wrong. So if I understand this correctly, the truth is attacking democracy, at least according to the Strib. Brian, is there lint in that media navel? My order’s bigger than your order! Is Bloomington a company town?